This can also be used as a crude, inexpensive heart rate monitor by taping it to your finger. As the blood pumps through, the lightness/darkness of your finger changes slightly to infrared, and this signal can be picked up by ADC and filtered to find peaks in order to find your heart rate. I'm shopping for parts for a pulse oximeter project. Would anyone happen to know the specific wavelength of the emitter? Peak emission wavelength at 20 mA is 940 nm. I think I heard about 910nm was perfect, so this works for me. Thanks. Tried using these to detect the needle passing on my water meter but they didn't seem to have the range (possible glare from the plastic face too). This is outputting a constant 5 volts no matter how dark the object being sensed is. Can anyone help? Trying to figure out the bandwidth - if I read the datasheet correctly, at a 10khz load, doubling the worst case rise/fall time should be about 5khz, or 15khz with a 1k load? My application is simple object detection (a ball passing through a chute), and I was initially very dissatisfied with the range of this circuit. In my case, my ADC Vref was hardwired to 3.3V, and I finally figured out why this limited range to about 1 centimeter. Running at 3.3V and 5V were both limited, the former because the IR output was too dim, the latter because the top of my Vout range was clipped by the ADC VREF. I ended up powering with 5V and adding a 10K resistor between OUT and GND. 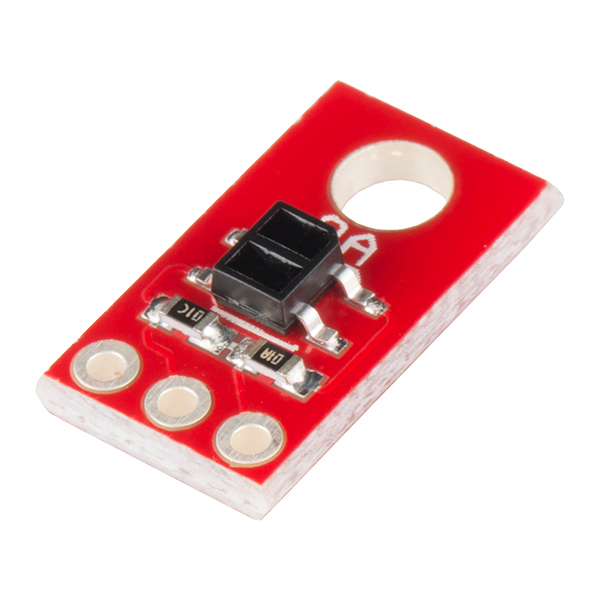 This allowed full-power IR led and cut my max Vout in half (2.5V), bringing the full range below my ADC Vref, which increased the sensing range of this unit to a full inch (2.5 CM). 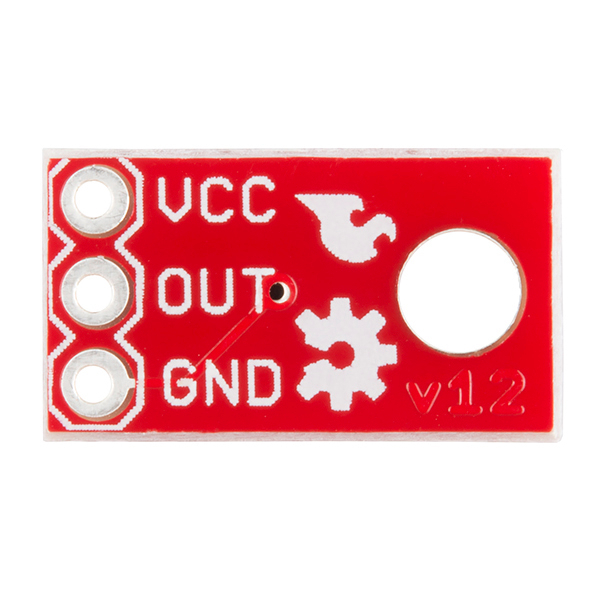 In the same way, you can hook this directly to a microprocessor's digital input by matching the value of this added OUT/GND resistor to your digital input characteristics (you'd want your IR Vout max just above the digital input's Vmax for a low signal). Also note that incandescent light (from standard tungsten bulbs) will throw the sensor way off as it's much stronger than the reflected IR light. I haven't tested sunlight, but I assume it'll have a similar effect. I'm using my microcontroller to calibrate the analog input to account for ambient light, which should work in low/indirect indoor light. 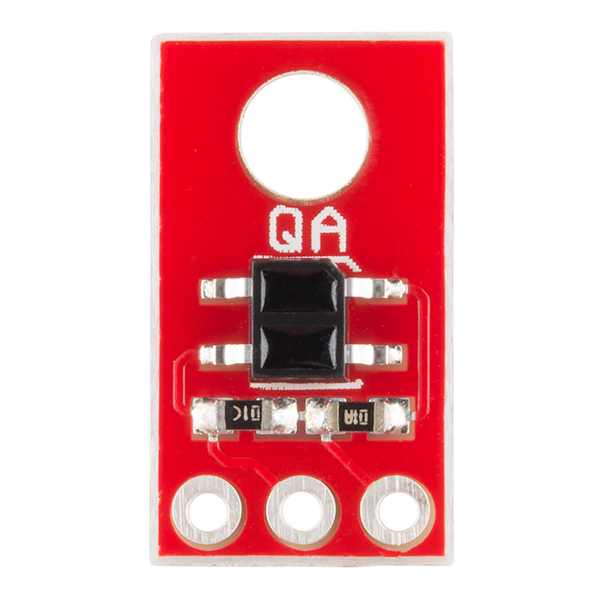 If I just want this to tell me black/white, can I connect these to an Arduino digital input pin and use a trimpot to adjust the sensitivity? The emitter current limiting resistor on the analog versions that are shipping October 2012 are measuring to be 100 ohms. The sensors are actually running pretty warm. The emitters are drawing 34mA at 5V - but a perfect 20mA at 3V3. I know the datasheet has absolute maximum ratings of 50mA, but... I have four of them runing at 5V and they're all running just over 100ÂºF. Are we sure this is OK? how can you connect those as an array like 3 or 4 in a row? Can anyone tell me the range on these? I've got several (analogs), for line following, but they only seem to work under 1 cm. Say I was using this with an Arduino Duemilanove. I think (I may be wrong) the analog inputs on it measure current, not voltage. So when you said "the lower the output voltage" did you mean current? Also, it says "We also have an digital version of this board" at the end of the description. Analog inputs on microcontrollers measure voltage. 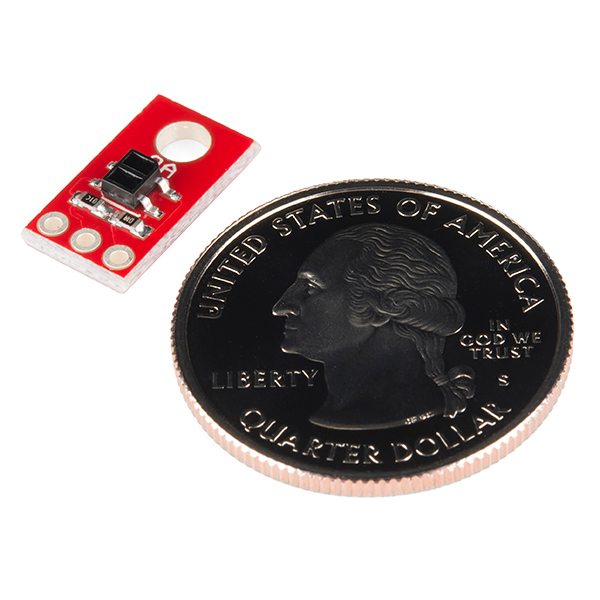 Speaking of Arduinos, here is an Arduino library for reading Pololu's version of this sensor. It should work for the Sparkfun version as well. These are great sensors. I'm going to see if I can make a heart rate monitor as davr mentioned. What are the SMD packages for the resistors? I want to replace them too. Just in case anyone is wondering, I emailed tech support and they confirmed the BOM has a 100ohm resistor for current limiting on the LED. I've yet to land these in my hands, but I'll post back if they're not actually 100ohm. I'm glad you carry these now. I bought the digital version by mistake, but converted them to analog by removing the cap and adding the appropriate resistor. Kludgey, but it works. You ought to make a breakout board for the Hamamatsu P5587: it's got a built in Schmidt trigger, so it's great for wheel encoders. 1) They don't take up valuable analog inputs. 2) Multiple digital modules can be read in parallel while analog modules must be read sequentially if your MCU only has one ADC unit. 3) The digital version can see farther with more resolution (see this app note for more info), though this added resolution comes at the cost of a decreased sample rate. Note that the Pololu QTR sensors no longer use the QRE1113; they now use a similar generic unit that has a slightly longer range. Used this sensor (duh) for a line following robot. I had previously used its much larger cousin, the QRD1114, with little success. However, no issues with this sensor: it was able to cleanly and consistently sense black electrical tape against wood, provided that the sensor was very close (within 1cm of the ground).